You are here: Home / Healthy Diet / Health Supplements, Vitamins & Minerals / Are Protein Shakes Safe During Pregnancy? It is imperative for a pregnant woman to get enough protein for her and the growing baby inside of her. The consumption of protein is pivotal for the continued growth of the baby; it also lowers the risk of complications during pregnancy, paving the way for a healthier delivery. How much protein does a woman need during pregnancy? The American College of Nurse-Midwives recommends that a pregnant lady should get at least 70 grams of protein each day during the second and third trimesters. According to The Institutes of Medicine, a pregnant woman should get anywhere from 10% to 35% of their calories from protein. In addition to paying attention to your protein intake, you should also focus on managing your total calorie intake. After all, your weight gain plays a major factor in determining your baby´s weight and future disease risk. Is protein shake good for a pregnant woman? Consuming protein shakes might appear to be the natural way to meet the protein requirements. However, there are many factors you must pay attention to when drinking protein powders. 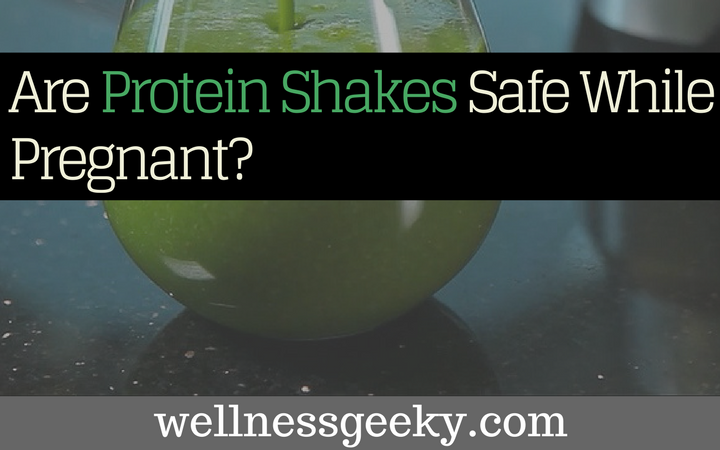 After all, protein shakes do contain herbs and other additives that can potentially be harmful during pregnancy. You should be careful to avoid protein shakes that contain herbs such as anise, licorice root, rosemary, sage, and ginger. The herbs above can potentially affect fetal hormones. And, when you drink a protein shake with your prenatal protein and vitamins, you could end up receiving too much protein, which is, again, not recommended. If you want to meet your protein requirements, protein shakes may not be the best source for you. These types of shakes are usually low-calorie, and hence, won´t support healthy weight gain for your baby´s development and growth. Therefore, it matters where you get your protein from. For instance, if you get protein from various, different sources such as fish, meat, poultry, and plant-based sources, in addition to getting protein, you also get a wide range of nutrients and vitamins that can be beneficial to breastfeeding women or pregnant women. For example, red meat is rich in iron and B12, and therefore, can help prevent anemia during pregnancy. Fishes are a rich source of DHA, a component that is instrumental in the development of a baby´s brain. There are plant protein sources such as legumes that have folate in abundance; folate supports neural development. If you have decided to get the protein you require the food you consume, it is better for you to opt for organic forms of meats, fish, legumes, eggs, and dairy. For instance, you should preferably choose grass-fed beef, farm-raised fish, and free-range, organic eggs over the factory manufactured items. You, as a pregnant woman, should aim to get a balanced diet that includes plenty of vegetables and fresh fruits too. Just like any other product in the market, protein powders and shakes also vary. Some simply have higher protein content than others. For instance, bodybuilders would undoubtedly want more protein than a person who is running a marathon. In addition to paying attention to the protein content, you should also ensure that the protein powder doesn´t contain ingredients that are harmful to you. As we mentioned earlier, protein can come from various sources such as eggs, milk, soy, and rice. Therefore, if you are allergic to any of the sources as mentioned above, you should ensure that your protein shake doesn´t contain any traces of it. It is also advisable for you to pay attention to how the protein is purified. Doing this is essential because it gives you an idea of how well your body will be able to break it down. Whey protein and soy protein are entirely different from one another. While whey protein made from cow´s milk, soy protein derived from plant sources. If you are allergic to milk and are a vegan, you should choose soy protein. However, we believe that whey protein is the better option of the two, as long as you are not allergic to it. Whey protein is high in amino acids and can, thus, help the body build tissues. There are also no risks associated with whey protein. Meanwhile, soy protein can have a high level of aluminum, given the manufacturing processes. The high level of aluminum can cause harm to the fetal development. A single protein shake is capable of adding a lot of calories to your body, more than you need. Therefore, you must plan your meals accordingly to ensure that you don´t get too many calories each day. You only require an additional 300 calories per day during pregnancy. It can get somewhat difficult to find products that don´t contain artificial sweeteners. And, although the FDA has approved several chemical sweeteners, some reports and studies state the harmful effects of artificial sweeteners, especially to pregnant women, regardless of FDA approval. Sucralose, the calorie-free artificial sweetener, is known to cause damage in the DNA of mice. You should also avoid saccharin, which crosses the placenta and can potentially remain in the fetal tissue. Hence, if you don’t want to take any chances and risk with your health and the health of your baby, it is best to avoid protein shakes that have artificial sweeteners. Instead, you can opt for protein shakes that have natural sweeteners such as lactose, stevia, and fructose, etc. If you want to take your healthy habits up a notch, you can even opt for options such as powdered honey.